It’s a fact. Any kinds of tea; hot,cold, black, white, green, fruity .. All of it! I think it stems from the fact that I don’t drink coffee, or juice, or soft drinks all that much (aside from Coke and Kaluha .. get in my belly! ), so to spice up my water drinking ways, I found a world of tea that I want to be in always. Every day. All the time. One of my best friends, Miss P. is also a fan of tea. And cuddles. Who doesn’t like cuddles amiright?! With this in mind, here’s a cross stitch I’ve done up for her. I feel like it sums her up to a T (pun intended – oh yeah, I went there). This hasn’t yet been washed or framed in the centre of the hoop, as I was tossing up between framing it in a hoop, or framing it in a picture frame. I think I’ve settled on the hoop though, and I’ll be using this idea to really make it pop. It’s quite a simple cross stitch really, with not a whole lot going on so I think the fabric hoop with give it some more life. Pingback: Tada! 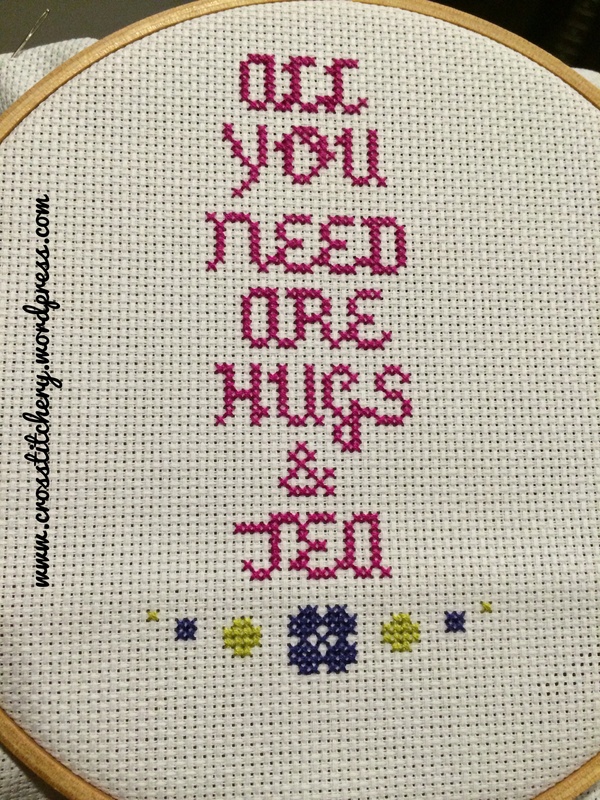 – Hugs & Tea Cross Stitch | crosstitchery.